It's an inescapable reality that if we're going to live the life of our dreams, it's going to take courage, willingness to risk, to attempt, to fail, to get back up. The morning of WEEP's Maasai Market debut rose upon us like the sun in the Rift Valley -- even though we were fully expecting and anticipating it, the size and magnitude was still exhausting. As I lay in bed, restlessly listening to about every other 5 seconds of a Rob Bell podcast, thoughts of fear and doubt began to subtly eclipse my initial conviction to allow the women to enter this phase independently. Instead of dwelling on all the potential catastrophes, I tried to dream of the positive: the women surveying their home, meeting their neighbors, displaying their carefully crafted creations, and selling to their first customer. As I slowly remembered my goal to empower the women towards independence -- and as Rob said something about ordinary people doing extraordinary things -- my 20th century Nokia began violently attacking both my night stand and my day dream. Almost before I was able to press the faded green button and cautiously ask 'Hello?' I was captured by the words that I had been mentally fleeing all morning. There's a problem. Ironically surprised that Murphy's Law seems to be one of the few that is consistently implemented throughout Kenya, I listened quietly as Mary (the Mathare coordinator) explained how our neighbor had occupied our space and refused to withdraw. 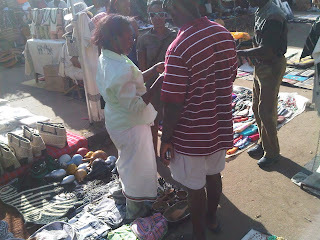 I suggested she call the Maasai Market chairman -- knowing full well that I could have called him -- and pressed the equally faded red button feeling like a dad who had just allowed his first born daughter to get bullied on her first day of kindergarten. As I tried sipping on tea to avoid slipping in to cardiac arrest, I slowly re-entered consciousness and remembered our training the week before. I remembered the dreams each woman shared, and the indescribable struggles that they had overcome just to be able to dream those dreams. I remembered stories of impossibly low cd4 counts, of husbands' abandonments, of begging on the streets and of feeding garbage to their children just to survive. In the same moment, I considered our current situation and almost laughed at how trivial it seemed. Somehow, I just knew things would work themselves out. When I went to visit the ladies at the end of the day, the magnificence of their display was rivaled only by their radiant and exhausted smiles that they displayed. Sitting on the ground (something we discouraged in training), they jokingly asked me if I wanted to buy something. After they ensured me for the 3rd time that the day was going really well, a smartly dressed mid-20 year old woman wearing one of their bracelets approached their space with a wide smile, proudly proclaiming I told you I'd be back! At that moment, I knew the launch was unquestionably a success. They had returning customers. An aspiration we had brainstormed tirelessly the week before. As the women closed up the sale with their new friends, I had the chance to review the day with Mary. Even though the smiles forming on her face narrated the whole story, I still asked what the numbers were. 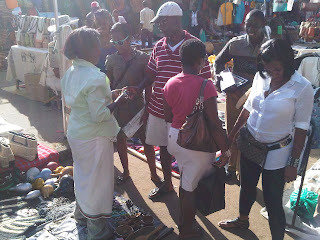 To my utter surprise, we had sold a total of 15 products and had received orders to produce several high margin items. 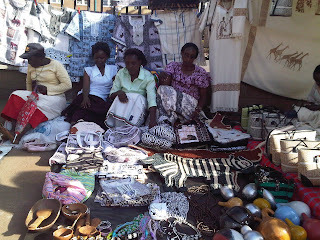 In our first day in the market, we sold almost 5,000 shillings worth, while the typical vendor in the market sales an average of sh2,000 a day. 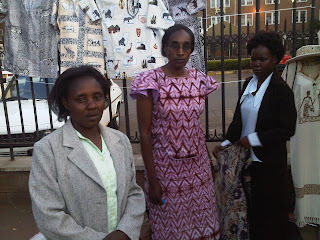 It was by far my proudest moment in Kenya to date. The women had overcome the odds, pushed through the speed bumps, and somehow created the courage to continue in the pursuit of their dreams. And as is often the case when people pursue their dreams, they were not the only beneficiaries: the other 30 women back in the centers (who are not yet ready for graduation) were watching closely; Not only meticulously evaluating in anticipation of one day selling in the Market, but also quietly praying they would have new orders to fill and would no longer be idle / income-less. I began to imagine their smiles and laughs as Mary summed up the day for me: We have several new product ideas, have developed a relationship with a new wholesaler, and have several new orders, all of which will keep our centers far more than busy for the next week. Exhausted but proud after a long day.